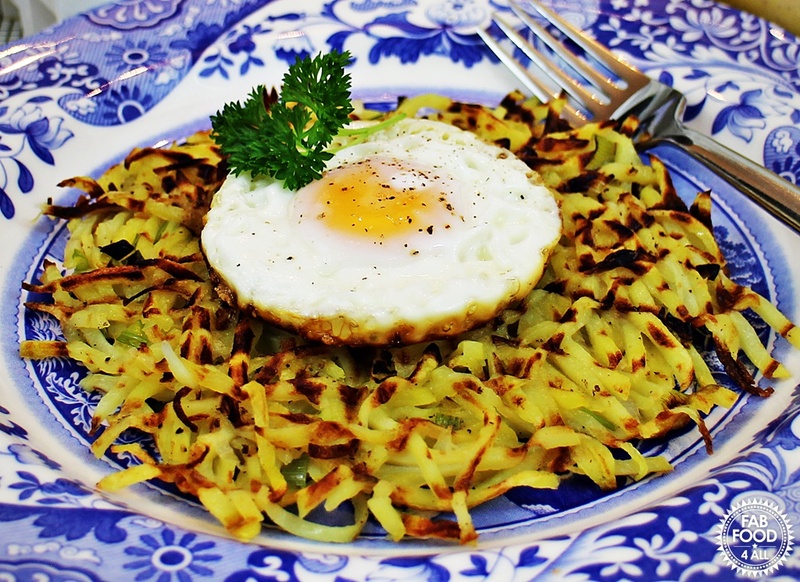 You are here: Home / Eggs / Potato Rosti Waffles – delicious & nutritious! Today I’m bringing you my Potato Rosti Waffles. I love potatoes so was very pleased when Albert Bartlett asked me to develop a recipe for them. I decided to use their award winning Elfe potatoes with their buttery taste, golden yellow colour and creamy texture and paired them with spring onions for an extra flavour dimension. 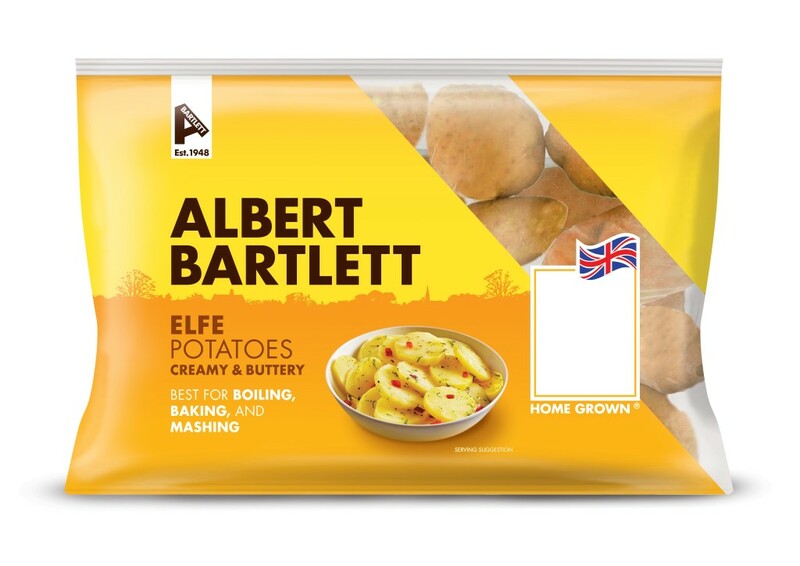 Did you know that potatoes are a great source of vitamin C and potassium as well as vitamin B6 and these Elfe potatoes contain just 0.1 g of fat per 100 g, so are virtually fat free. I peeled my potatoes for these Potato Rosti Waffles but there’s no reason why you couldn’t leave the skins on in order to benefit from the valuable fibre they contain. 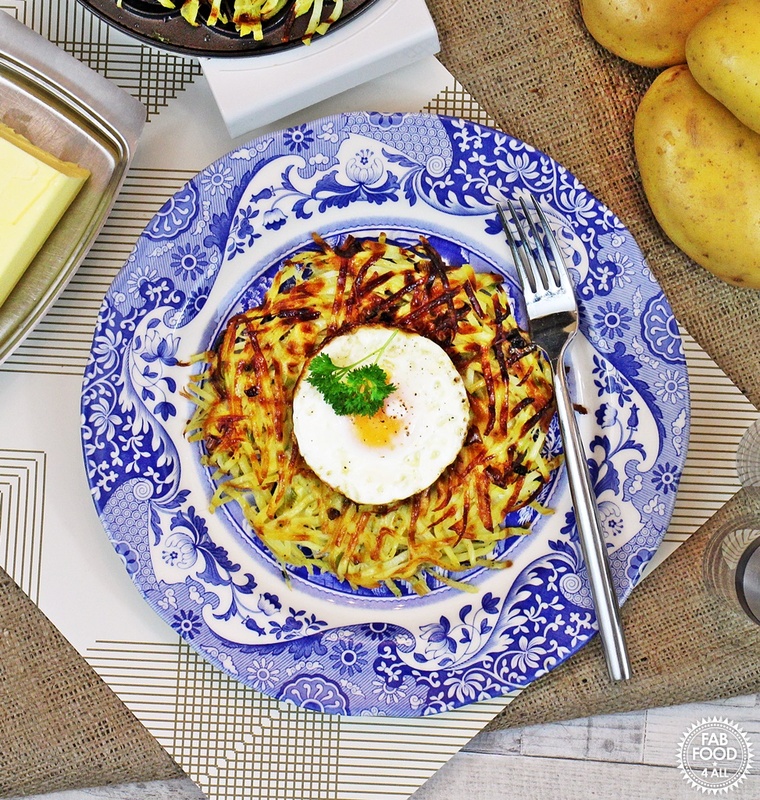 Some rosti recipes call for parboiling the potato but there really is no need here. In the waffle iron the potato part steams and part fries to give perfectly cooked Potato Rosti Waffles in about 8 minutes. 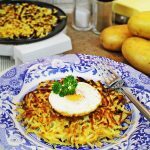 Great on their own for breakfast, lunch or dinner with a fried egg or used as part of a full English breakfast etc these Potato Rosti Waffles won’t disappoint! When I was going through the development stage my daughter saw a picture of an early version and was very upset at having missed out on the taste testing. I then had to promise to make the next batch when she was around. However, this wasn’t possible but the brilliant thing with these waffles is that you can cook them ahead of time and then reheat in the oven at your convenience. So did my Potato Rosti Waffles get the thumbs up from the family I hear you ask? Well of course they did, big time! The Albert Bartlett Elfe potatoes have such a wonderful buttery taste that they suit these Potato Rosti Waffles perfectly! I’ll be making many more in future and next time will make extra to pop in the freezer as they’re far better than any potato waffles you can buy! NB: This recipe post commissioned by Albert Bartlett, all opinions are my own. 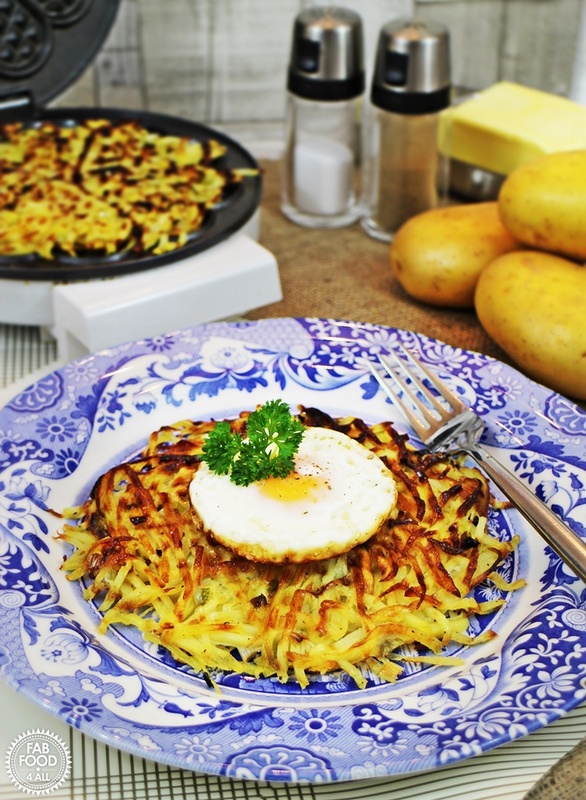 Potato Rosti Waffles are the perfect served with an egg for a nutritious meal or cut up and served as a side dish. Peel the potatoes and cut into fine julienne using a mandolin (or alternatively grate coarsely). Place potatoes into a bowl of cold water to soak for 3 minutes (I used my salad spinner), then rinse in a colander until the water runs clear to remove the starch. If you have a salad spinner use it to dry the potato and finish off by patting with kitchen paper. Otherwise wrap potato in a clean towel and squeeze to remove all the moisture and then pat dry. 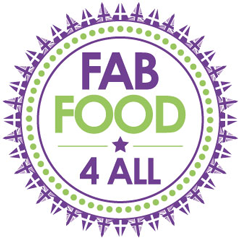 Place the potato, spring onion, melted butter, rapeseed oil and seasoning into a bowl and mix well. Place half the mixture into the waffle iron and cook until golden brown and potato tender (about 8 minutes). Serve waffles whole with a fried or poached egg (serves 2) or cut up into sections and served as a side dish (serves 2 - 4). 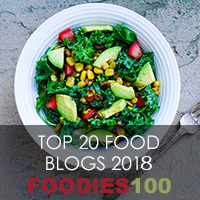 Previous Post: « Simple Slow Cooked Beetroot – so easy! These were delicious, 100% worth the effort!